The Heritage Group has replaced its annual membership fee with an annual voluntary contribution to the Heritage Group Award Endowment Fund for RRC students in need of financial assistance. This allows us to award thousands of dollars each year to students in need. Thanks to the Manitoba Scholarship and Bursaries Initiative (MSBI), the provincial government will also contribute one dollar for every two that we award to students. Donations of $20.00 or more will automatically be tax receipted (donations of $10.00 only receipted upon request). Donation cheques should not be made out to the Heritage Group or to any individual’s name. Finance will not deposit any cheque that is not made out to Red River College. Cheques should be issued to Red River College. Winnipeg, Manitoba, Canada R3H 0J9. To be added to our member list, simply make a request using the comment box below. 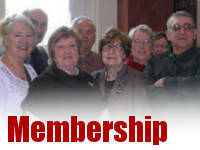 You are automatically a member upon retirement, and there is no longer a membership fee. Dues have been replaced by a voluntary donation to the Heritage Group Award Endowment Fund. You can actually make an online donation (if you wish) right from this page, or by contacting Elena Grinshteyn (Phone 204.631.3324 | Email egrinshteyn@rrc.ca) at the RRC Development office (C306-2055 Notre Dame Avenue, Winnipeg, Manitoba R3H 0J9).